Getting into debt is easier than you might think, especially with credit cards. The combination of easy accessibility and high levels of temptation makes credit cards one of the most common forms of debt. If you’re sick of always struggling with your debt, here are 4 simple steps to break your credit card addiction. Before you do anything else, it’s essential that you sit down and work out exactly how much you owe. Totalling your credit card debt will help you to plan how you can best work towards getting control over your finances once more. Your ultimate goal is to pay back your card’s balance in full, then refrain from using it unless it’s an emergency. By knowing your debt, you can start planning the next step: your budget. 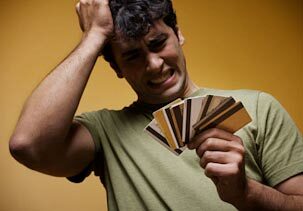 Most problems with credit card debt can be traced to budgeting issues. When you have a clear and strict budget, you will always know exactly how much you have available for expenses, savings and other purchases. By tightening your budget and sticking to it, you are far less likely to give in to the temptation of impulse spending. Make it a priority in your budget to pay off your credit cards as fast as possible so that you can stop paying interest and start saving even more money. Credit cards provide the ultimate temptation. They give you the opportunity to spend money you don’t have on the things you want, and instead of waiting, you can purchase now and pay later. Unfortunately it is exactly this ease of use that makes credit cards so dangerously addictive. Even with a strict budget, you might still struggle to resist the temptation of your credit cards. If you’re worried about this, try leaving your cards at home in a safe place so you don’t have it on you and can avoid impulse spending. Unlink your card from any PayPal or online purchase sites, and use your debit card for purchasing on the web or over the phone. While it sounds like a cliché, cutting up your cards can actually really work. You benefit from being unable to use the card, you don’t harm your credit rating by cancelling it, and it is a strong physical representation of the commitment you have made to break your addiction. For personalised financial advice on the best way to break your credit card addiction, consider consulting a professional debt consolidation company. They can help you to find the most effective strategies for getting rid of your credit card debt, and can set you up with positive savings habits and budgeting assistance to keep you on the right track for the future. Getting rid of your credit card debt isn’t easy, but you’ve already taken the hardest step: getting started. By being proactive and acknowledging that there’s a problem, you’re on your way to enjoying a life free of crippling credit card debt. By working through these 5 steps, you will finally be able to regain control over your finances and banish your credit card addiction for good. Credit cards can be really an ultimate temptation! That's why I really try to keep them at home not to be tempted to make this or that purchase. Though it's not the only easy way to borrow the money you need, actually nowadays we have a lot of financial traps around and should be really very careful not to get into any. Hey nice post Denny! Also like to agree with the first comment.It is really temptation unless one can use it properly.